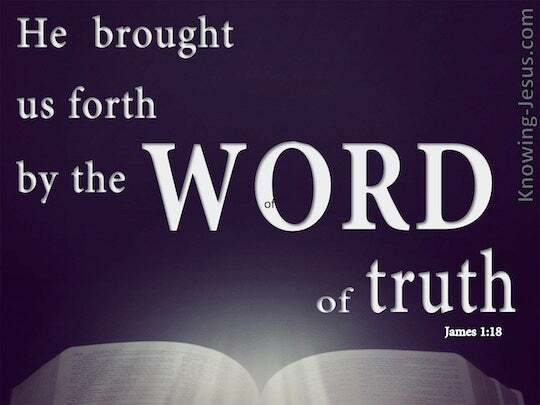 ﻿ James 1:18 having counselled, He did beget us with a word of truth, for our being a certain first-fruit of His creatures. having counselled, He did beget us with a word of truth, for our being a certain first-fruit of His creatures. 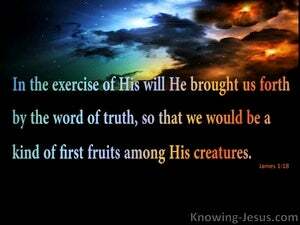 In the exercise of His will He brought us forth by the word of truth, so that we would be a kind of first fruits among His creatures. By His own choice, He gave us a new birth by the message of truth so that we would be the firstfruits of His creatures. In accordance with his will he made us his children by the word of truth, so that we might become the most important of his creatures. Having deliberated, he begot us by the word of truth for us to be a certain first fruit of his creatures. Of his own will, he begot us with the word of truth, in order that we might be, as it were, the first-fruits of his creatures. Of his purpose he gave us being, by his true word, so that we might be, in a sense, the first-fruits of all the things which he had made. 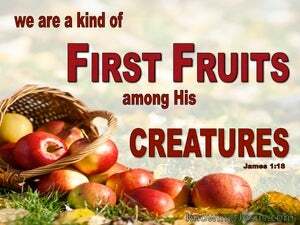 Of his own will he brought us forth by the word of truth, that we should be a kind of first fruits of his creatures. 'tis he that has voluntarily renew'd us by the oracles of truth, that we might be the first converts of the new creation. According to his own will begat he us by the word of truth, that we should be a certain first-fruits of his creatures. Of his own will begat he us by the word of truth, that we should be some first fruit of his creations. Of his own accord he brought us into being through the message of truth, so that we might be a kind of first-fruits among his creatures. Of his own will begat he us by the word of truth, that we might be a kind of first fruits of his creatures. He, of his own will, has begotten us with the word of truth, that we should be the firstfruits of his creatures. 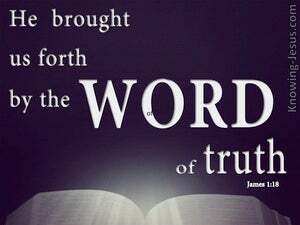 Having willed he brought forth by the word of truth, for us to be some first fruit of his creatures. [By his] will he gave birth to us through the message of truth, so that we should be a kind of first fruits of his creatures. Of His own will He brought us forth with the Word of truth, for us to be a certain firstfruit of His creatures. Of his own will begat he us with the word of life, that we should be the first fruits of his creatures. It was his own will that we should be born by the Word of the truth, to be a kind of firstfruits among his creatures. Because he willed, he gave us birth through the word of truth, so that we should be a kind of first-fruits among his creatures. By his sovereign plan he gave us birth through the message of truth, that we would be a kind of firstfruits of all he created. Of his own will he begot us with the word of truth, that we should be a kind of firstfruits of his creatures. Of his own will begat he us by the word of truth, that we should be a kind of first fruit of his creatures. Of his own choice he produced us by the word of truth, that we might be a sort of first fruit of his creatures.? ?19 Wherefore, my beloved brethren, let every man be swift to hear, slow to speak, slow to wrath. Because he so willed, he gave us Life, through the Message of the Truth, so that we should be, as it were, an earnest of still further creations. Of his own will he hath begotten us with the word of truth, that we should be a kind of first-fruits of his creatures. In accordance with His will He made us His children through the Message of the truth, so that we might, in a sense, be the Firstfruits of the things which He has created. In accordance with His will He made us His children by the message of truth, that we might be a kind of first fruits among His creatures. Having willed it, He brought us forth with a word of truth, that we might be a certain first-fruit of His creatures. who hath of his own will begotten us by the word of truth, that we might be a kind of first-fruits of his creatures. who -- not of blood nor of a will of flesh, nor of a will of man but -- of God were begotten. Holy is Israel to Jehovah, The first-fruit of His increase, All consuming him are guilty, Evil cometh in unto them, an affirmation of Jehovah. Woe to those secure in Zion, And those confident in the mount of Samaria, The marked of the chief of the nations, And come to them have the house of Israel. who is father of us all (according as it hath been written -- 'A father of many nations I have set thee,') before Him whom he did believe -- God, who is quickening the dead, and is calling the things that be not as being. and through him to reconcile the all things to himself -- having made peace through the blood of his cross -- through him, whether the things upon the earth, whether the things in the heavens. every one who hath been begotten of God, sin he doth not, because his seed in him doth remain, and he is not able to sin, because of God he hath been begotten.